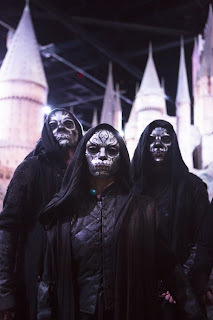 Secrets behind the Dark Arts will be revealed for the first time this half-term at Warner Bros. Studio Tour London – The Making of Harry Potter. For one week only visitors will learn how the Dark Arts were brought to life in the films. Discover how the costumes were developed for the most infamous characters, learn about the make-up techniques used to help the actors get into character and come face-to-face with Death Eaters. Other special features include a ‘lesson’ in the Potions classroom where the real contents of the potion jars will be explained. Over 500 of the original jars are displayed all with handwritten labels. Some of the few remaining Prophecy orbs will be on show at the Malfoy Manor fireplace with revelations about their use during filming in the Hall of Prophecy. An extra layer of fabric was added to Voldemort’s™ costume every time he became more powerful. During filming for Harry Potter and the Order of the Phoenix™ over 50 meters of silk were used. Aragog, the giant spider, was covered by hand with yak hair, sisal and hemp from brooms. 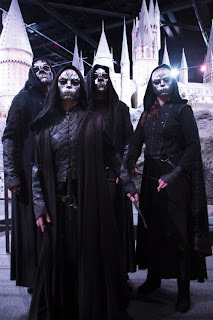 The make-up effects used to create the Dark Lord included temporary tattoos for veins, enhanced cheekbones, contact lenses and false eyebrows, fingernails and teeth. Each werewolf prosthetic was made with real goat hair that was inserted strand-by-strand. The Prophecy orbs are made of glass and were filled with seed pods, mushrooms, mussels and rubber frogs. The secrets behind the Dark Arts will start on Saturday 27 October to Sunday 4 November.